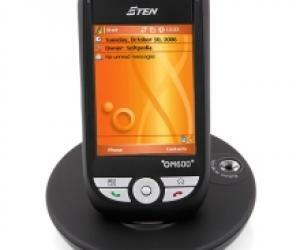 E-ten is not content with making a smart phone with Microsoft Windows Mobile. They have also stopped into an unusually powerful processor to handle Skype and some very smart software. Sure, E-ten M600 is designed to be useful. But the matte black plastic shell feels more stylish than the more trite silver shells that dominated on mobile products in recent years. 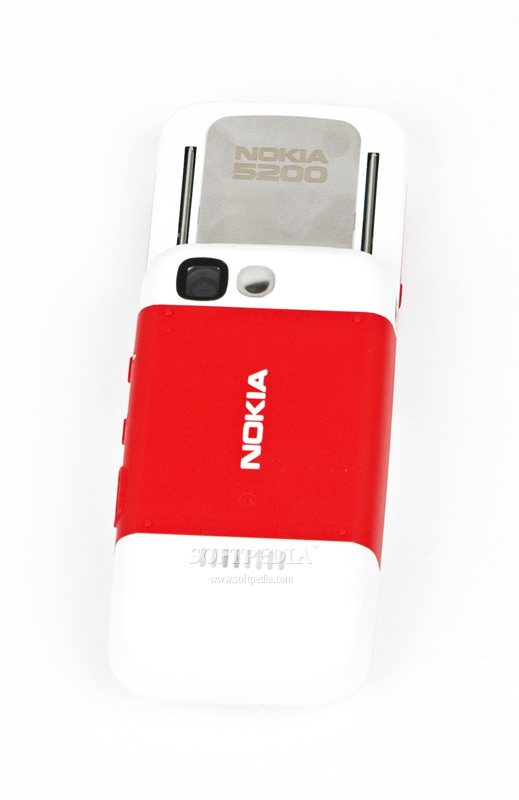 The front of the phone is dominated entirely by generous color screen. The buttons are few. Below the screen are red and green handset, and a mediocre designed trackpad for menus. On this page, the volume button and camera button. 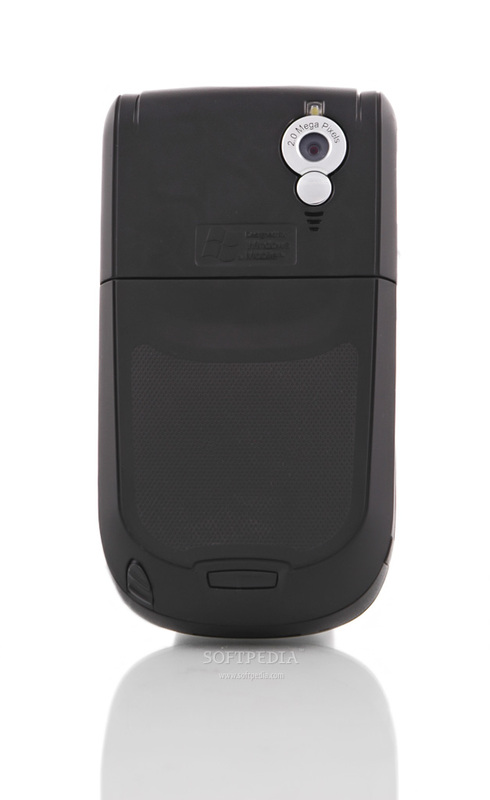 What’s new with E-ten M600 is some special features, like advanced voice control. 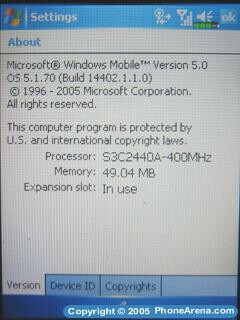 It has an expanded collection of applications thanks to the new system Windows Mobile. 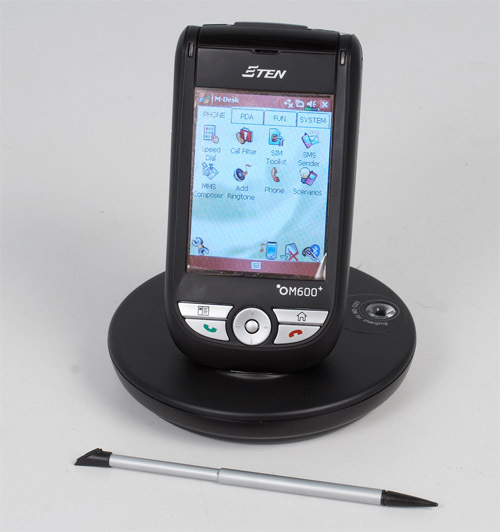 In addition, the M600 supports high-speed internet access via w-lan and the free program Skype. Under the volume buttons on the side sits a button that starts the voice control. I can, for example, say “Call Bill Gates at home” to get my M600 to call Bill Gates, assuming I now had him posted in my phone book in the phone. Now we come to the problem. I don’t have Bill Gates, or so many others with English-sounding names in my phone book. And unfortunately, the E-ten M600 bad at understanding the Swedish name. Nokia has a similar feature in some of its newest phones (such as the N70 and 8800), and understand Swedish name much better. But in parts of voice control in the M600 actually works. If I click on voice control and says “read sms” reads the M600 will automatically upload my unread sms. It needed no training of this voice control, but it understands additions English commands and has a speech synthesizer that can read aloud text. Pronunciation of Swedish words may not be so good, but it is possible to understand after awhile. The command “Play music” start the music player, and there are a lot of additional commands to start programs and features. 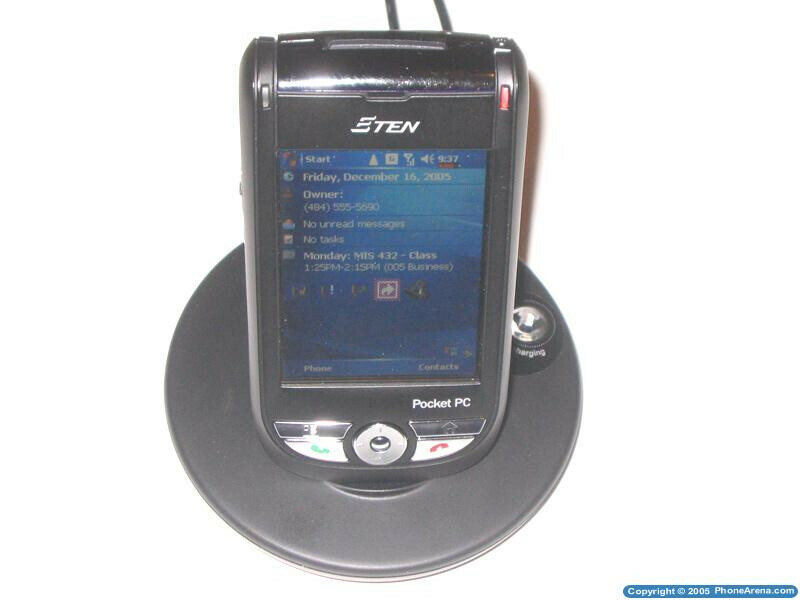 The music player in the E-ten M600 is Windows Media Player. Among other media features include a megapixel camera that takes pretty half-baked pictures. But if the light is good when the images are good enough to send to other mobile phones. There are a lot of programs under the rind of the M600. 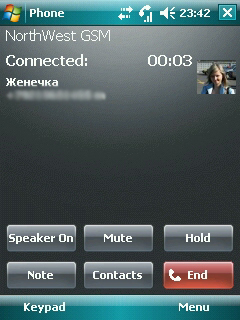 Voice control is something that E-ten put themselves, but Microsoft has from the start a lot of utilities in Windows Mobile. For example is applications Word Mobile, Excel Mobile and Powerpoint Mobile uploads. It is simply a simplified versions of Microsoft’s classic Office productivity. Laying of documents on your phone and use them when you are not on the computer is excellent. When the phone is in the docking station and is connected to your computer, simply transfer the files to the folders in the phone as when copying between folders on your computer. All input is done with the stylus on the screen. This applies to both menus and clicks when I enter text. For text input, can I choose between a small virtual keyboard on the screen and input by writing on the screen with a plastic pen. When the computer is not being used is a plastic pen, plugged into a small canal that runs right through the phone. Internet, e-mail, and other nutritious program is naturally important in this kind of product, almost more important than the telephony features. To connect to the internet via the mobile network is therefore the first thing I try. Settings, I had to do manually with a help text that I found on my mobile operator’s website. On the other hand, impresses not internet speed. Not compared to 3 g phones. But it will do good to the mail and some Web browsing. The M600 has Web browser Pocket Internet Explorer and e-mail program which I can sync with Outlook on your computer. Much faster than the usual mobile connection with w-lan. The price has dropped on equipment, and cafes and hotels often have w-lan. It’s no longer just us tech enthusiasts who have a wireless computer network (w-lan) installed at home these days. One of the main innovations in Microsoft’s new system is just an improved support for w-lan. And it shows in the E-ten M600. It automatically detects available networks; even when I go out on the town are scanning the air and suggest the logins on the nearby networks. Benefits of w-lan, of course, is that you get a much faster internet. Are you sitting on a w-lankafe allows you to make calls over the internet. I tried namely installing handheld version of Skype on the M600, and after a total reboot (reset) of the M600 Skype worked perfectly. The sound was crystal clear and cost-free. I have never had such good sound when I used Skype on a PDA or smartphone. One reason why the sound is so good is that the M600 has a powerful processor, which is able to manage the telephony over the internet. W-lan is of course useful too because the internet and e-mail is much more enjoyable when the M600 is connected via w-lan. On the phone’s home page is also including an icon that leads me into Instant Messenger MSN Messenger, which in this cell phone works quite similar to MSN Messenger on your computer. The sound using Skype is so good. But the sound is good even when I am talking on the phone as usual via the mobile network. Both for me and the one I speak with, it becomes a bit too much treble, a bit metallic. But it is common in the phones that do not have perfect sound, and maybe something you can accept in a handset that offers so much more. What I have is more difficult to accept is actually the battery life. 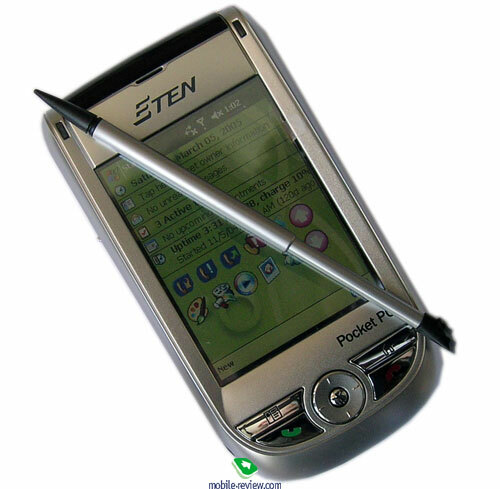 The battery times E-ten self-report is not reasonable, for example, that the M600 should be used as a handheld computer in 10-15 hours straight before the battery runs out. I would like to say that at a reasonably active use of the M600 is not enough battery power even for a whole day from morning to evening, at least not if you occasionally during the day using w-lan. W-lan in the M600 seems namely pull very much power. 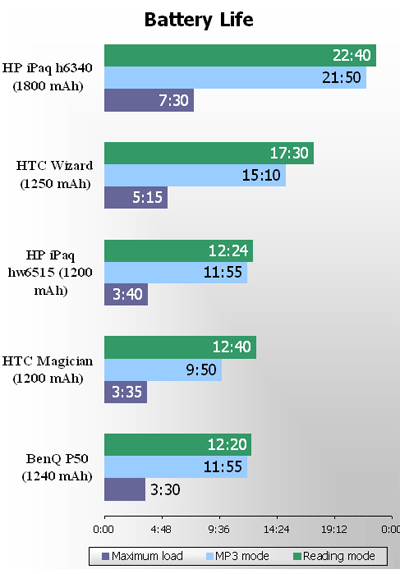 But w-lan feels the battery life more tolerable, even if the battery life even then feels lighter. If I were to buy an E-ten I would definitely cost me to also purchase at least one spare battery to take with me in my pocket. Timely enough, E-ten in the docking station is also a charging slot for spare battery. Another warning, I must actually point to the stability of the system. Sometimes the phone seems to freeze the system for a few seconds or longer. You can then push the reset button, but it is not a desirable condition. It is unclear if Microsoft comes with an update that corrects these bugs. Distributor of E-ten in Sweden say, however, that software that manages battery life and other things will be updated via the update files from the Swedish distributor’s website. It speaks to the bugs and poor battery performance can be addressed. Finally, we note that the traditional mobile manufacturers are still one step ahead when it comes to basal simplicity in ordinary phone functions. May, for example, a multimedia in E-ten, an information box about the usual mobile manufacturers would have a simple question: “do you want to read?”. Here you have to select “Menu” and then “Dismiss” to remove the icon that shows a new incoming message. 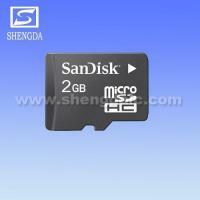 Microsoft-phones have a way to go to the mobiles that are best for ease of use.